Due to high winds and increased windchill this morning, the race committee has made the executive decision to delay the race start until 11 am. Races will commence straight into Rounds without a qualifier, utilizing yesterdays results as the qualifier times. Best of luck today and congrats to yesterdays participants and winners! 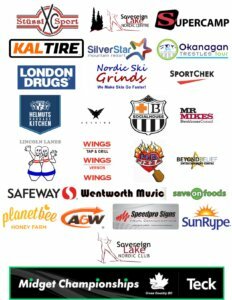 Sovereign Lake Nordic Club is thrilled to be hosting the Teck BC Midget Championships this year! We’d love to have you join us for the most fun ski event of the year for kids aged 9-12! At this year’s Midget Champs you can expect all the fun stuff about races mashed into one weekend! There will be racing, of course, where the focus will be on team spirit and having a great time skiing. 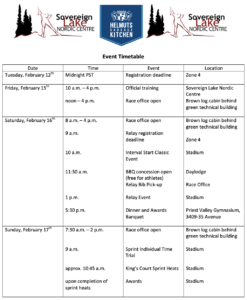 If you are unsure about racing or new to it, this event is the place to start. There will be costumed relays, a banquet on Saturday night featuring a taco bar and some very special local entertainment, brought to you by former Midget racers. Don’t worry, we’ve got a hot lunch for the racers covered on Saturday, and we will be flipping plenty of extra smokies that will be available to keep the fans fed too (veggie option available too)! Please join us February 16th and 17th for friendship, fun, sharing the love of skiing, and lots of great draw prizes!